People who use calendars to organize their daily lives have them visible in plain sight nearly all of the time. Yet, on your PC, you have to go through a myriad of windows and clicks before you can even see your calendar. So to bridge the gap, I've come up with this simple program that will place the Microsoft Outlook Calendaring system right on your desktop. The calendar object gets pinned to your desktop and stays there all the time in plain sight so you can always see what's upcoming. Of course, the benefits don't stop there ... because it's the actual Microsoft Outlook calendar, you get all it's functionality, such as direct editing, drag and drop of files, etc. Places a fully functional Microsoft Outlook Calendar directly on your Desktop. You can create items, edit items, remove items, etc. 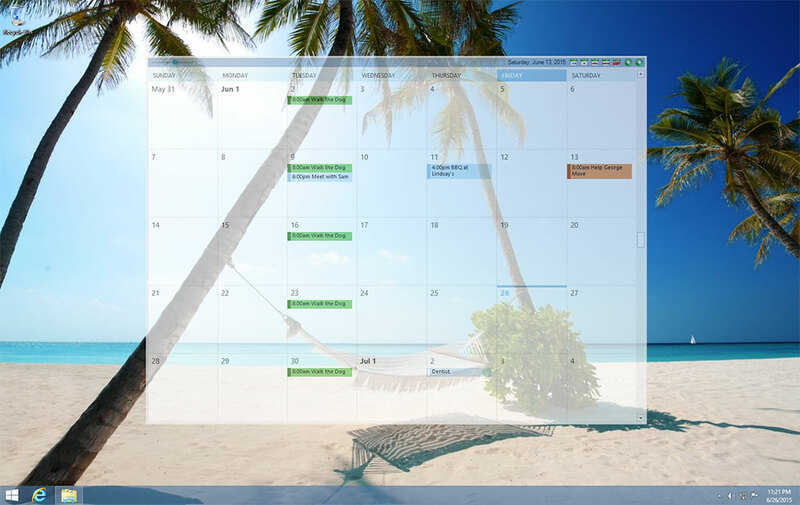 The Calendar is pinned to your desktop so that no windows can get stuck behind it. The Calendar's position, size and opacity are all easily adjustable. Full HiDPI and multi-monitor support allows you to place instances across all your screens. A tray Icon (which shows the current day of the month) is provided to to configure more advanced options in the app. Ability to switch between any outlook view, including: calendar, inbox, contacts, tasks and notes views.